Amersham is a beautiful quaint market town with a population of around 15,000. It lies within the stunning Chiltern Hills district of Buckinghamshire. 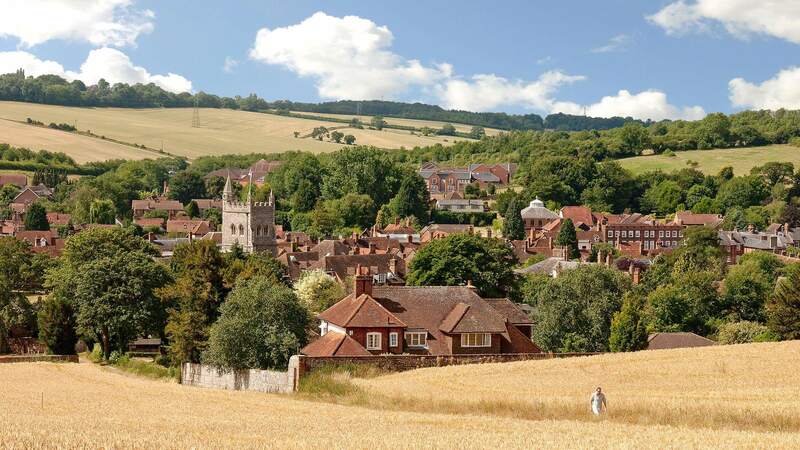 There are two distinct areas to the town, Old Amersham, which is set in the River Misbourne valley and is home to the 13th century church of St. Mary’s along with some splendid old pubs and coaching inns. In the old part of town, you will also find some delightful and unusual shops. Then there is the more modern Amersham-on-the-Hill, which quickly expanded around the railway station during the early 20th century. Part of the London commuter belt, Amersham is 15 miles from Aylesbury, 13 miles from High Wycombe, and around 26 miles from central London, a journey that takes 40 minutes by train. With it being within easy reach of London, the town is a much-desired location for those who want the benefits of working in the capital while at the same time enjoying a much slower pace of life with beautiful rural surroundings during their time off. When you first visit Amersham, the number of fine old buildings that date back centuries and are still in use will likely impress you. You will immediately feel this is a town of historical importance. Amersham has numerous old-fashioned gabled timber cottages and traditional inns and pubs with doors that open directly onto the high street. At the heart of Amersham is Market Hall, which was built in 1682 and is supported by arches above what used to be an old twin lock-up, traditionally used in rural parts to house drunks for the night. Apart from the fabulous traditional housing, Amersham boasts many splendid detached properties, which sell for the average price of £1,062,215. Amersham has an overall average selling price of £701,323, which means moving can be an expensive business if you find yourself in the position where you need more living space. Property prices in the town are 17% up on last year and a whopping 32% up on 2015. If you currently own a three bedroom Amersham property and need an extra room, the home you move to is likely to be quite a lot more expensive that what you can sell your current property for. Therefore, unless you are willing to move to a less desirable location, an Amersham loft conversion to gain more space is a no brainer. Why Choose Touchstone To Convert Your Amersham Loft? In our 30 years in the loft conversion industry, we have converted many lofts of all shapes and sizes in Amersham for homeowners who need extra space or who want to increase the value of their property. Many of our Amersham customers come to us after being referred to by a previous customer. We are very familiar with the planning regulations in the town, and have only ever been turned down for the permissions we requested once in Buckinghamshire, and we have made literally hundreds of applications over the last 30 years. Because we are loft conversion specialists, rather than a general building company, we have experts working in-house who can complete all aspects of the work, so no part is outsourced. This means we can consistently maintain our very high standards. Get in touch with us on 0800 881 8194 or fill out the contact form. We will then arrange the best time to visit and survey your loft at your convenience. Once we know what you want to gain from the conversion, we will give you a completely free no obligation quote. A loft conversion in Amersham will give you more living space, and a very healthy return on your investment, so what are you waiting for? Get in touch with us today!